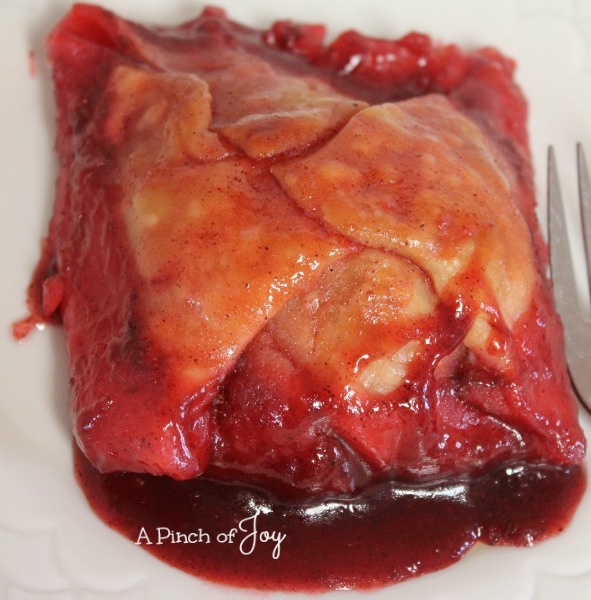 Apple Dumplings are one of my very favorite desserts. Absolutely adore them!!! And who wouldn’t? 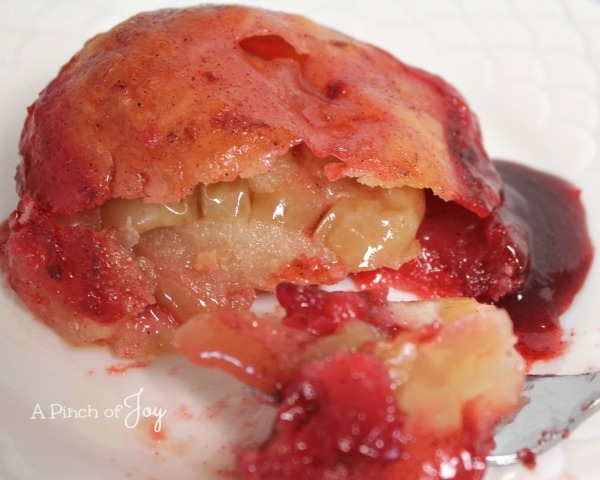 Great apple taste and texture wrapped in flaky crust and baked in a cinnamon butter sauce. Serve warm. Add a scoop of vanilla ice cream to take the dessert to celestial levels. Let cool and serve with an extra spoonful of syrup from the pan for cinnamon zing. Refrigerate and have for breakfast. Except there won’t be any left overnight unless you hide it in a Velveeta box — cooled and wrapped well. 🙂 Not that I would ever use that trick. Apple dumplings are not a quick fix. But they are SO worth the bit of time and effort!!! Especially for a special treat for a holiday. Or a special someone. Or a family in need of a WOW! They are, however, straightforward and easy to make. Start with your favorite pie crust — home made or purchased. 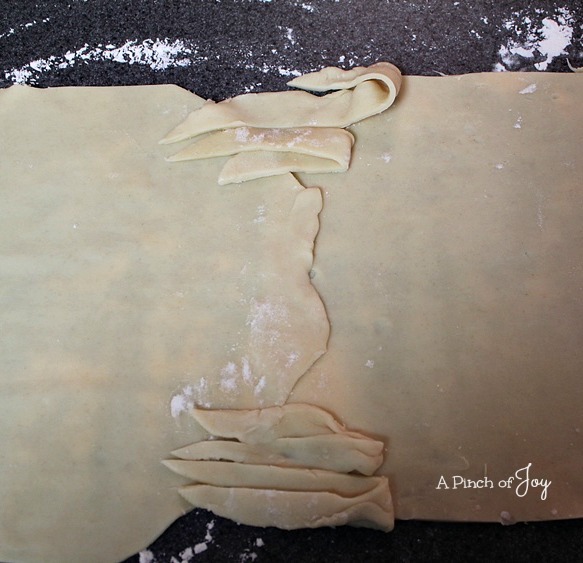 If you buy piecrust, there is always the problem of getting from two circles of dough to one long rectangle. Problem solved this way: Lay the two circles side by side on your rolling surface with about an inch of overlap in the middle. Cut an inch off the top of each circle and place in the “indentations” as shown. Repeat for the bottom. Press the patches and middle seam together. 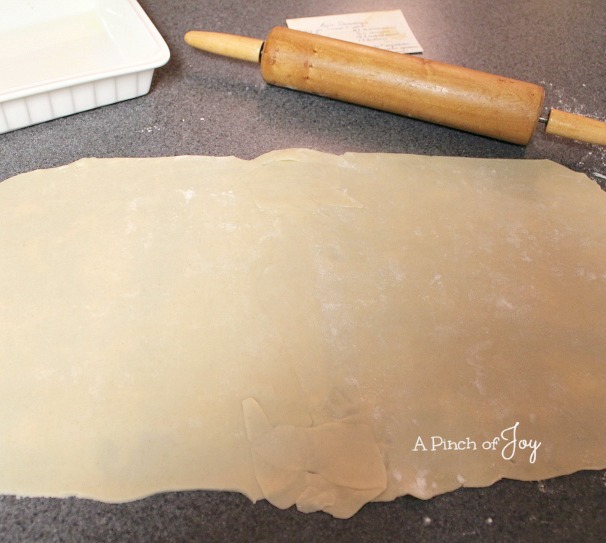 Roll the pie crust into a long rectangle. The finished rectangle will be about ten inches by twenty four inches. See the original recipe card in the photo? Those brown cinnamon stains certify this is a gooooood recipe. I like sweet so I always choose something like Gala, Honeycrisp, even Red Delicious apples over Granny Smith or other tart apples. Some people like the contrast of the tart apple with the sweet syrup. Feel free to use my share of tart! Coz I’m not gonna use it! This also shows my hybrid method of peeling. A lot of the nutrients are in the peel and I hate to throw them away. But trying to cut through a dumpling with a lot of peel inside is a little messier than this dessert deserves. Even desserts need to be able to reach their full potential. Especially desserts, come to think of it. So I take off about half the peel. Compromise is an art. 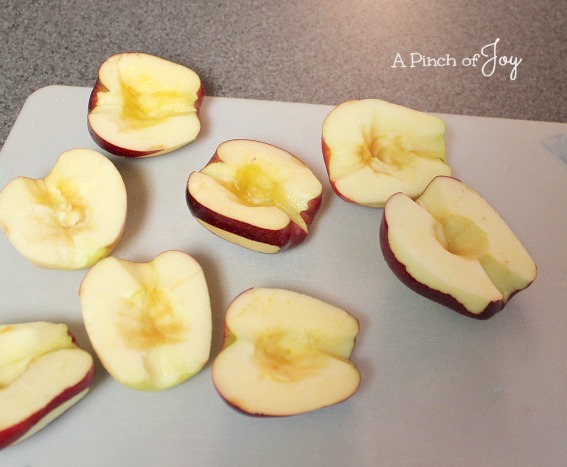 Cut each of five apples in half and remove the core. Yeah, I know I told you to cut the dough earlier. I took this picture while I was sizing everything up. You can wait till you have the apples ready before you cut the dough, if you want. Not trying to be bossy here! Place apples round side down on the crust. Mix the cinnamon and sugar together and spoon about half a teaspoon of cinnamon sugar into the cavity of each apple half. Top with a pat of butter and a dash of nutmeg. 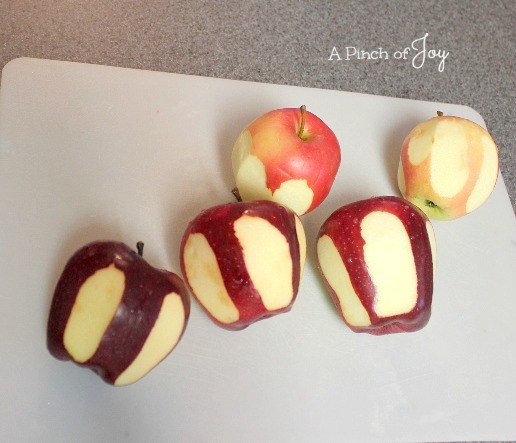 Fold the corners of the square to the center of each apple half. For a medium apple halved, the 4.5 inch square should meet in the middle. You will have a pretty classic apple dumpling! But we all know that pretty happens only about 50% of the time in life. You’ve never had a bad hair day? Your dumplings will all be perfect, I’m sure! When apple dumplings have a bad hair day — say the crust won’t quite meet because the apple is bigger or the crust tears or some other unpretty thing — there is a solution. Turn that bad boy over so the smooth crust covered curve is on top and press all the problems to the underneath. I told you this was my favorite dessert! 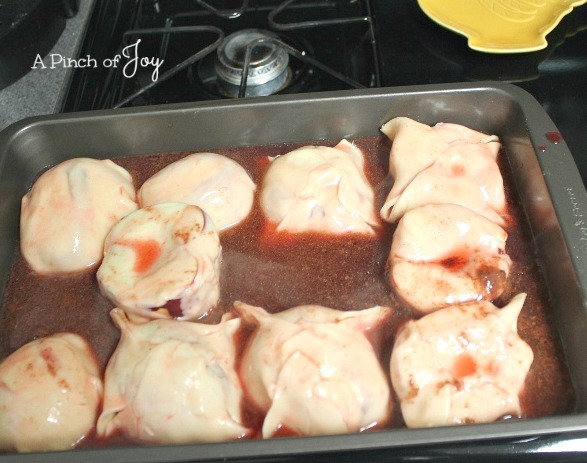 Be sure to boil the cinnamon sauce for three minutes before pouring over and around the dumplings. I like to add red food coloring for visual appeal, but it is certainly optional. Yield is ten servings. Great for a group. But if you need a smaller amount, you can freeze what is not needed for immediate use. Just don’t wait too long before popping the packages into the freezer. The contents will disappear. Bake until lightly golden and syrup has thickened somewhat. Cool a bit so the tender dumplings don’t fall apart as you take them from the pan. 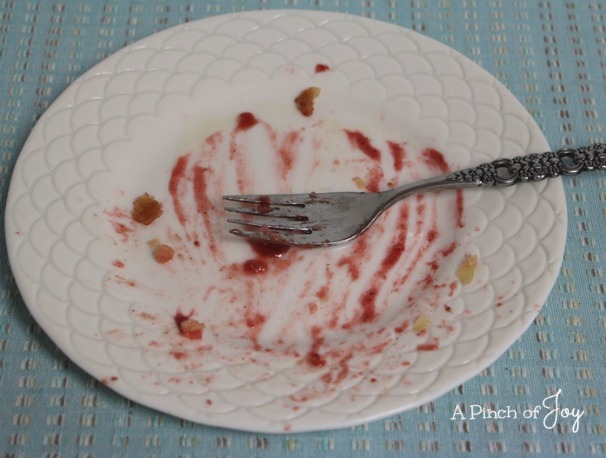 Put a fork in it. The world falls away while you are in the midst of the Aurora Borealis and harp music. The proper ending for an apple dumpling. . . .
Apple wrapped in flaky crust and baked to perfection in cinnamon sauce! Serve warm with ice cream or whipped cream for a slice of heaven. 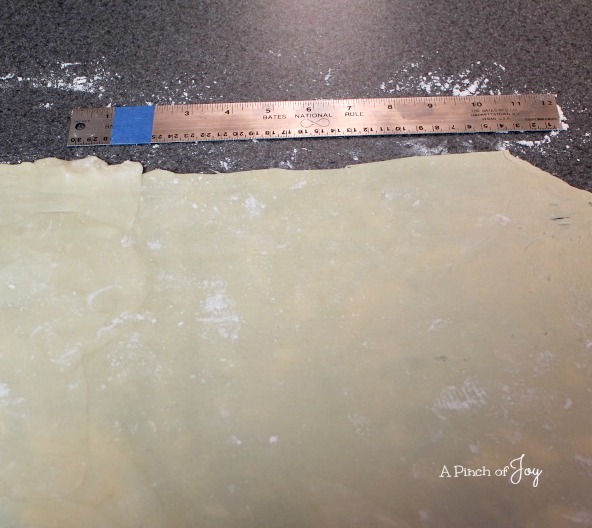 Roll out pastry into rectangle and cut into 4.5 inch squares. Place peeled and cored apple half on each square, cavity up. Mix cinnamon and sugar and put ½ teaspoon of mixture into each apple cavity. Add water to remaining cinnamon and sugar, add 3 tablespoons butter and bring to boil. Reduce to medium heat and boil for three minutes. Remove from heat promptly. 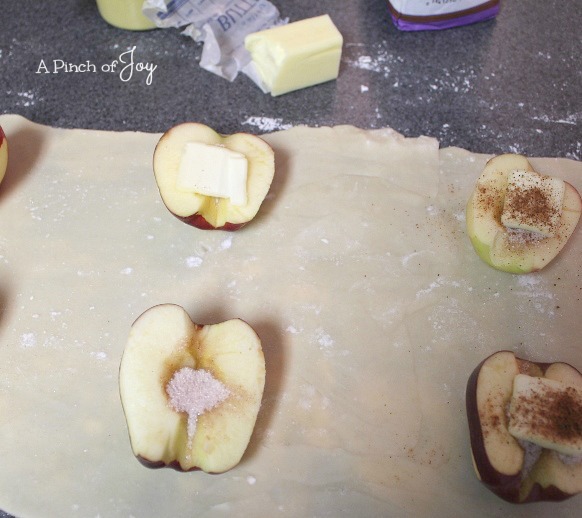 In the meantime, add a pat of butter to each apple cavity. Sprinkle each half apple with a dash of nutmeg – about ⅛ teaspoon each. 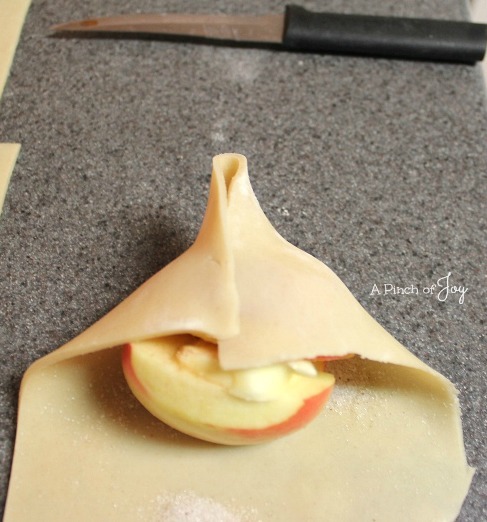 Bring pastry points to middle of apple, pressing to seal. Place in 9x13 baking pan. Pour hot cinnamon sauce over and around apple dumplings. Bake at 425 for 40-45 minutes until lightly golden and syrup has thickened somewhat. Cool for 10-15 minutes before removing from pan. Serve warm. 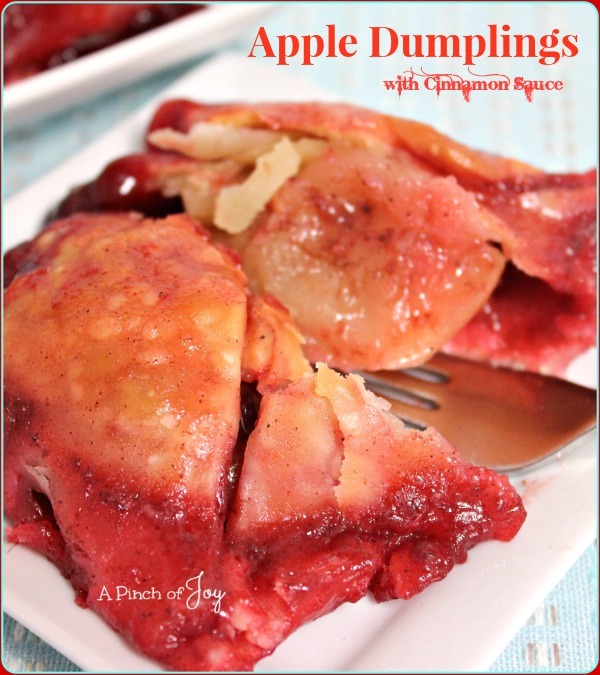 Apple Dumplings, one of our all time favorites, this looks fabulous! Hope you are staying warm and cozy in this cold weather and thank you so much for sharing with Full Plate Thursday.